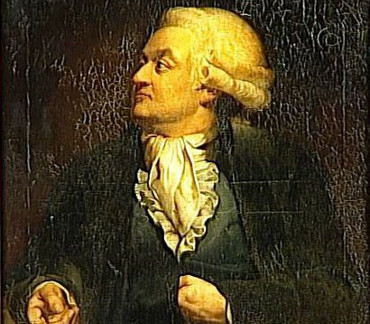 During the early years (1789–91) of the French Revolution Mirabeau rose to the top and became a voice of the people. A successful orator, he was the leader of the moderate position, favoring a constitutional monarchy built on the model of Great Britain. When he died (of natural causes) he was a great national hero, even though support for his moderate position was slipping away. The later discovery that starting in 1790 he was in the pay of the king and the Austrian enemies of France caused his disgrace. Historians are deeply split on whether he was a great leader who almost saved the nation from the Terror, or a venal demagogue lacking political or moral values, or a traitor in the pay of the enemy. French revolutionary (1749-1791). Letter signed. N. p. Small 4to. 2 pp. on double leaf. 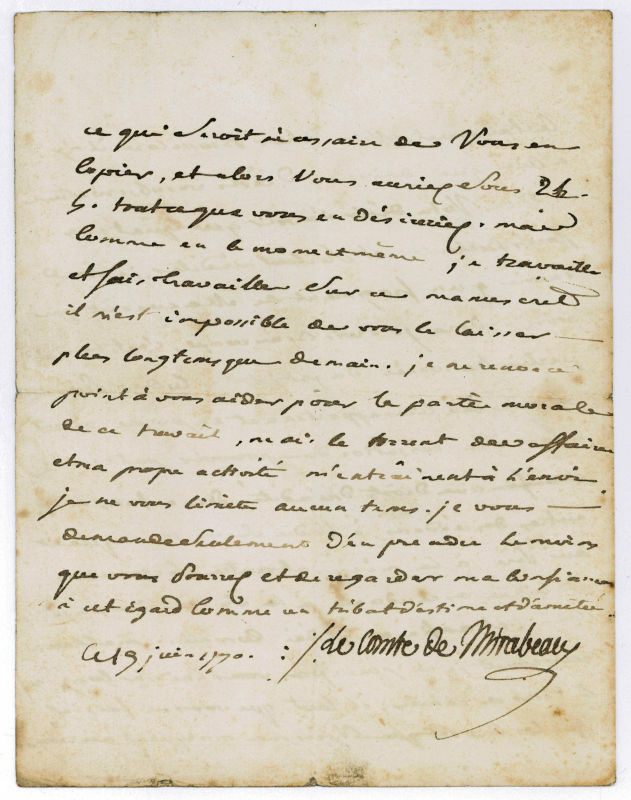 To "mon cher Brosselard", i. e. the French politician, journalist, and author Emmanuel Brosselard (1763-1837), on research, work, and analysis of the "Code prussien": "[...] Je vous envoie un fragment de Manuscrit qui vous en dira je crois beaucoup, c'est la partie raisonnée du Projet du Code Prussien relative aux biens appartenant en propre aux enfans á la cessation du pouvoir paternel, et enfin aux droits d'hérédité des enfans ou autres descendans à l'ordre succession [...] malheureusement je ne puis pas vous laisser longtemps ces cahiers, il faut que vous ne fassiez que les lire, et que vous me marquiez au crayon ce qui seroit nécessaire de vous en copier [...] je travaille et fais travailler sur ce manuscrit, il m'est difficile de vous le laisser plus longtemps que demain. Je ne renonce point à vous aider pour la partie morale de ce travail [...]". - Somewhat wrinkled, spotty and dusty..
French revolutionary (1749-1791). 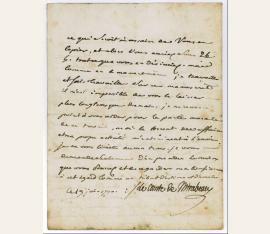 Letter signed ("Le Comte de Mirabeau"). N. p. 8vo. 3 pp. To an undisclosed recipient, wishing to discuss the particulars of a new public education system in France: "J'ai reçu, Monsieur, un temoignage de votre bienveillance, etre n'est pas le premier dont vous m'avez honoré [...]". - Transl. from the French original: "I received, Monsieur, a token of your kindness, and it was not the first with which you have honored me. I have delayed in answering you because I was in bed, deprived of sight, and I didn't want that the hand of a secretary temper the expression of my gratitude. It is sincere [...] when good citizens such as you and, which is a very honorable coincidence, good citizens illuminated by the meditation and study of works which have produced everything which is great in the world, take up the task of consoling public men for the calumnies, iniquities, ostracisms which are their surest emolument. If nature hadn't endowed me with some tenacity, and my bizarre destiny, in sowing my way with shackles, hadn't provided me with some compensations of this kind, my very ardent sensibility would long since have consumed me. I would be very charmed [...] to make your closer acquaintance and to talk over your ideas on a new system of public education, for the moment is approaching for dealing with it, and we have been building on moving sands if we don't give our entire edi!ce such underpinnings. 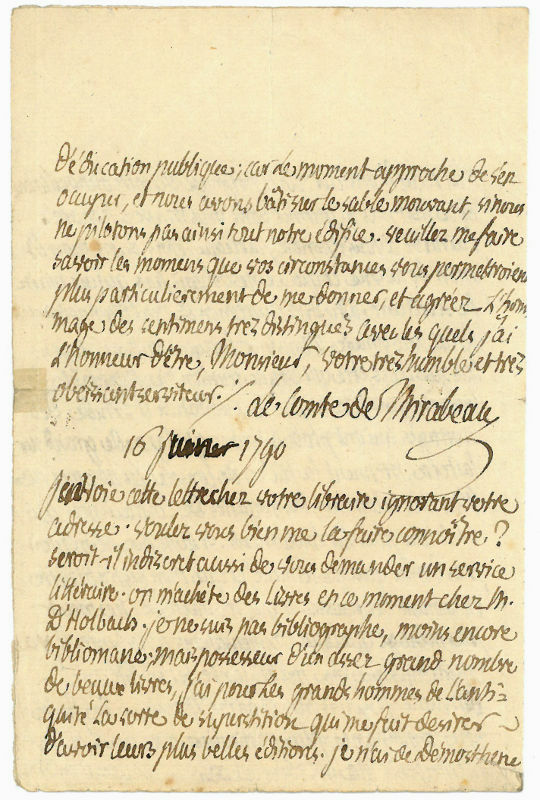 Please let me know the moments that your circumstances would permit you to give me in particular, and agree to the homages of the very distinguished sentiments with which I have the honor to be [...] your very humble and very obedient servant" [...]. 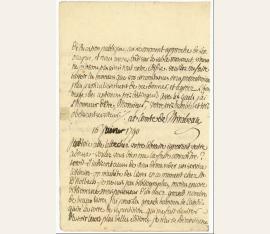 - In a lengthy postscript, Mirabeau has added: "I am sending this letter to your bookseller, as I don't know your address. Would you like to let me know what it is? Would it also be indiscreet to ask a literary favor of you? Books have been bought for me at this moment at M. d'Holbach's. I am not a bibliographer, much less a bibliomaniac; but am the owner of a rather large number of beautiful books. I have for many of the great men of antiquity a kind of superstition that makes me want to have their most beautiful editions. Of Demosthenes I only have the Works of Demosthenes and Aeschines, the first Greek orators &c. by Hieronymus Wolf, Frankfurt 1604 - Could you indicate the preferable edition? And the best editions of the Greek classics in general? I have been told of a Demosthenes edition in which there is a kind of medallion where this god of eloquence holds in one hand three crowns and in the other a raised dagger. Do you know this edition? [...]". - Some damage to edges and slightly dusty..